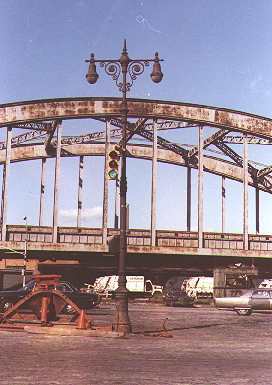 Once the mainstay of multilane boulevards in the pre-expressway era, cast-iron twinlamps once decorated highways like the Grand Concourse in the Bronx and Queens Boulevard and Horace Harding Boulevard in Queens. They did appear in other situations, however, and I’ve captured two on this page. 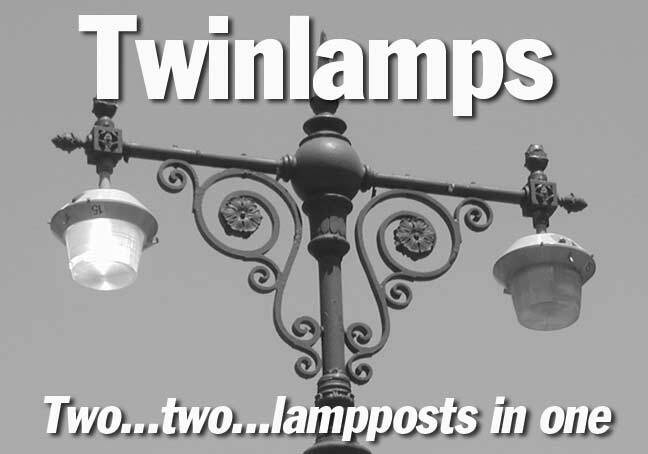 Twinlamps, and other castiron NYC lampposts, are classified by catalog. 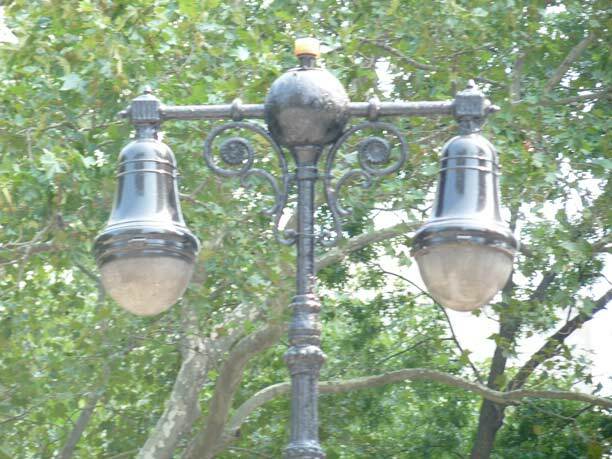 In 1934, the NYC Bureau Of Gas and Electricity (which like today’s Department of Transportation) was responsible for streetlighting) published The System Electric Companies: Photographs of Street Lighting Equipment As Of November 1, 1934. 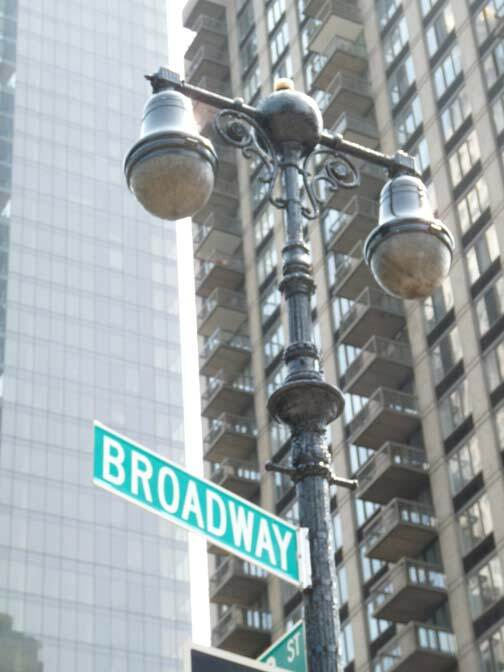 The pamphlet gave code numbers to every type of streetlight in NYC, identifying 76 types! Of those 76, only 19 have representative samples today. 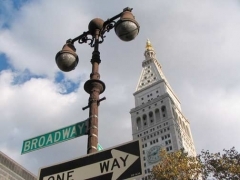 The original Fifth Avenue poles are classified by the pamphlet as Type 3 Twins. 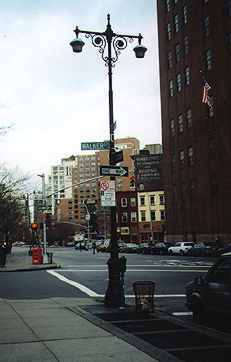 Originally installed in conjunction with the 1892 Columbian Exposition commemorating the 400th anniversary of Columbus’ arrival in the New World, these posts were installed, one to an intersection, on 5th Avenue from Washington Square north to 59th Street and later, to 110th Street. 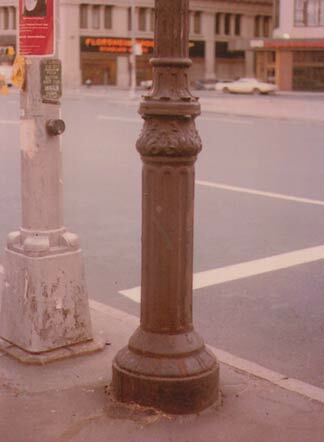 Through the decades, this post gradually replaced the ‘Type 3’ posts in use since 1892 on Fifth Avenue, until by the 1960s, these twins outnumbered them. Of course, most of them were replaced by modern snakeneck posts by the mid-1960s. 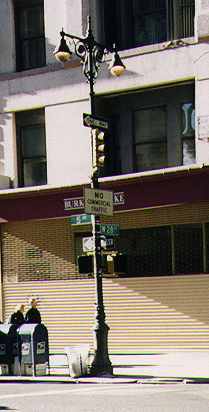 The 2nd ancient Twinlamp on 5th and 23rd was on the southwest corner. This one was razed about 2008. 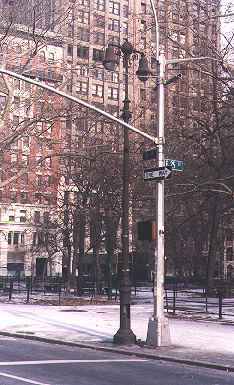 On the northeast corner stands one of the last existing original Fifth Avenue twinlamps. 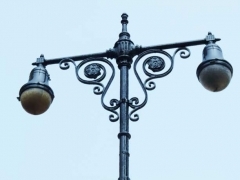 They were created specifically to be used on The Queen Of Avenues in the late 1890s, and served the avenue proudly until they were replaced by the current double-snakeneck poles in 1964-65. 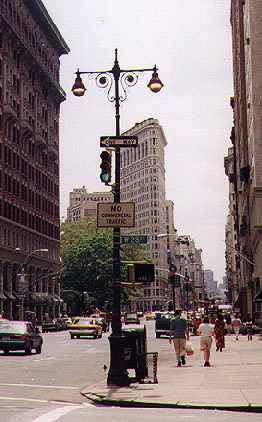 The design was specified for use on 5th Avenue in 1910. Even this one is a hybrid, though, as it boasts a Type 1BC (bishop crook) base with a Type 3 Twin mast stuck on top. In 2011, the Madison Square Twins were given new shiny black paint jobs. 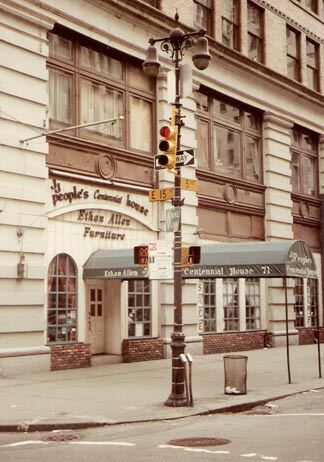 Original Type 3 Twin, 5th Avenue and 25th Street. This was reduced to its base only by the 1980s, and subsequently removed. 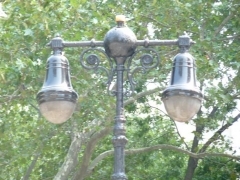 City Hall Park has become a repository of old streetlamps and contains a clutch of bishop crook poles and twinlamps. 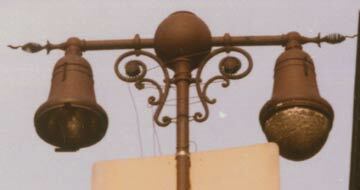 At left we see once such twinlamp that still boasts its bell-shaped luminaires, which were installed around 1940. 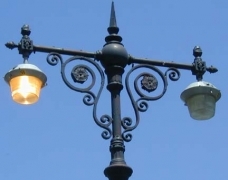 The cast iron pole itself dates from much earlier in the century. As of spring 2000 these have been refitted with sodium vapor pendant lights. 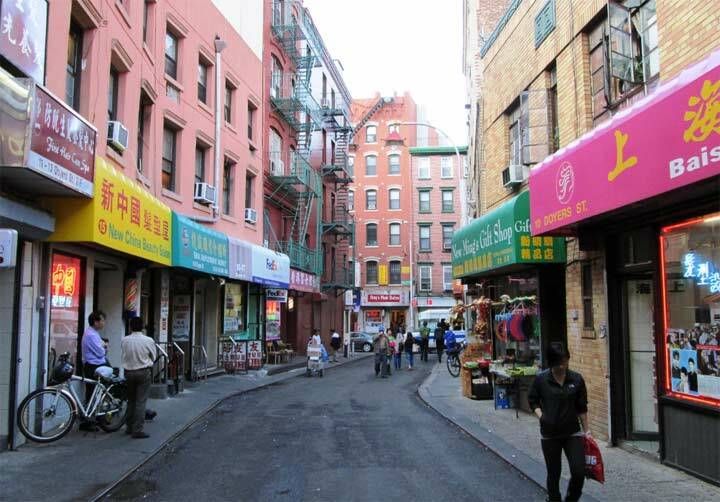 …and East 17th Streets. Photos: Bob Mulero. Type 3’s had three spring-shaped finials, one at the apex and two at either end of the crossbar. Each of these posts is missing one or more finials. 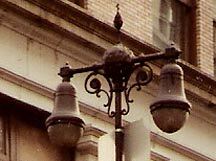 The original Fifth Avenue twinlamps bore subtle design differences from other twinlamps used in the city. Their arms were shorter and they had a globelike structure at the top of the shaft. 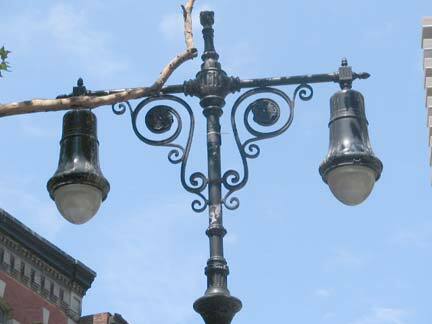 As time went on, they became intermingled with the other style of twinlamp (see first photo) which was more commonplace throughout the city. The 1934 System Electric Companies: Photographs of Street Lighting Equipment pamphlet refers to this post as ‘Type 1 Twin.’ It is NOT the original design from 1892, but is a close copy, since it combines the original twin top with a more substantial shaft and base. 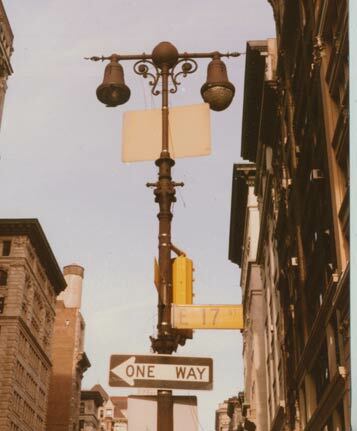 Above we see a twinlamp still lighting Sixth Avenue and Walker Street after many decades. Since Sixth Avenue was not extended south to Church Street until the 1920s, the lamp probably dates from that period. 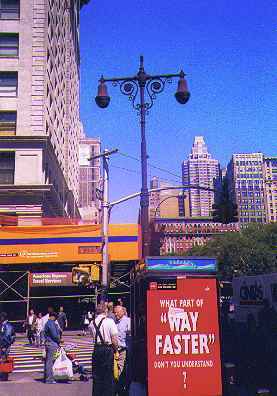 Until the mid-1980s, the Walker Street twinlamp at 6th Avenue boasted two of the increasingly rare Gumball-type luminaires. Commoner in other parts of the country, ‘Gumballs’ were becoming scarce in NYC streets by the 1950s. 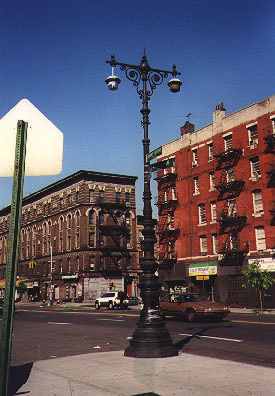 In the early 1980s, many of the classic old cast iron streetlamps were desecrated with the indignity of having to wear the ugly bucket-shaped luminaires which were then necessary to carry the bright sodium vapor lights that were neded as city crime increased. Since that time though, technology has improved and the new sodes are housed in retro luminaires that copy the old designs. 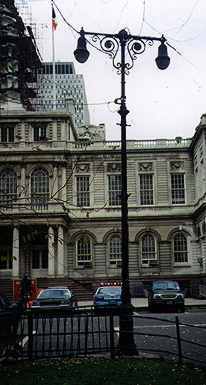 As of 1999, this lamppost has lost its central finial If it’s crumbling, it may be endangered. 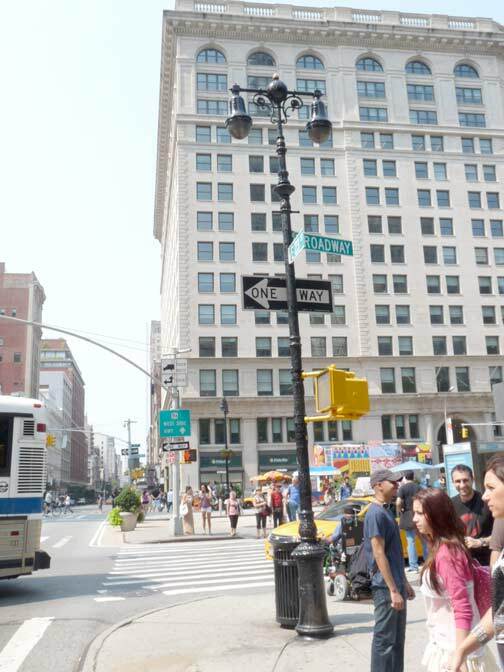 Canal and West Streets featured a Twinlamp with subtle differences in the shaft and luminaire attachments. 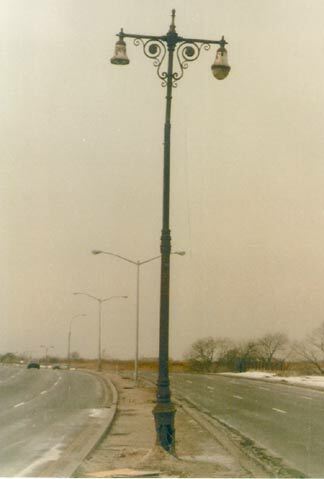 This pole had been removed, along with the trestle carrying the Miller Highway over Canal Street, by the mid-1980s. There are plans for a new park in this site; perhaps new poles using a similar design will be installed. 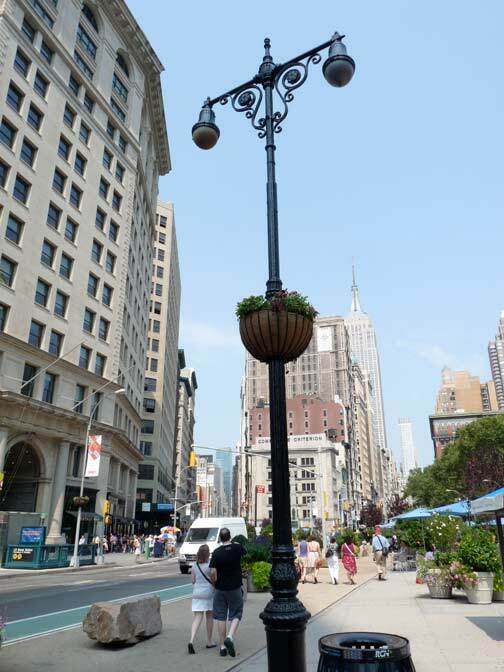 The stretch of Fifth Avenue between Madison Square and the Empire State Building still boasts five twinlamps. 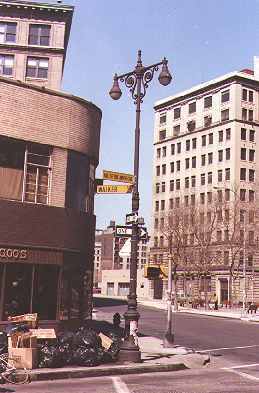 This one at the corner of Fifth Avenue and 28th Street is fitted with cup-shaped luminaires installed around the end of the 1940s. 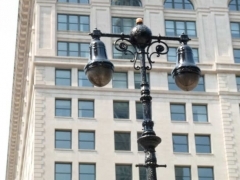 This pole has probably seen four generations of luminaires: the oval-shaped bulbs it wore from 1895-1915, the white acorn-shaped globe from about 1915-1938, then bell-shaped globes which were interchangable with the cup-shaped ones seen here. 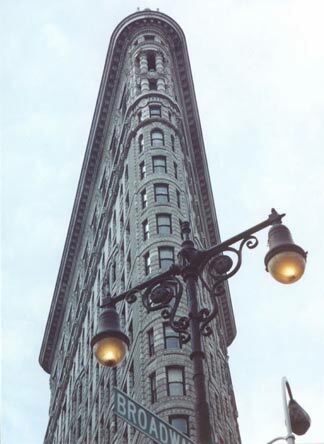 The graceful twinlamps, along with buildings recognized worldwide like the Flatiron Building, symbolize New York City. LEFT: Battered survivor, Rockaway Boulevard at JFK Airport, 1986. This post was removed shortly afterward. Photo: Bob Mulero. This magnificent specimen, though marred by the intrusion of sodium “bucket lights” still guards proudly Alexander Hamilton Square, formed by Amsterdam Avenue, Hamilton Place and West 143rd Street. Alexander Hamilton’s residence, The Grange, is a block east on Convent Avenue. Note the extra ornamentation on the shaft and base. The System Electric Companies pamphlet refers to this as a Type 6 Twin. It used to have an even more distinctive top, but it was replaced in the intervening years with the common variety of twinlamp top. 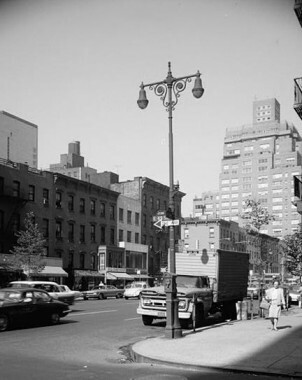 The twinlamp at left stood at Fifth Avenue and 14th Street. 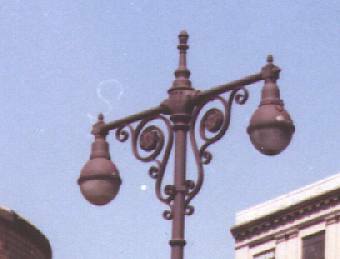 In this 1899 view, we see the original electric fixtures on the castiron poles, which look rather ostentatious to us now. 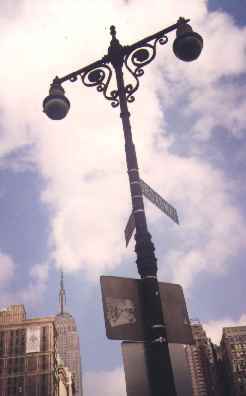 Fifth Avenue boasted a great number of these poles from the 1892 well into the 1960s, when they were replaced by the current snakeneck Deskey lamps. 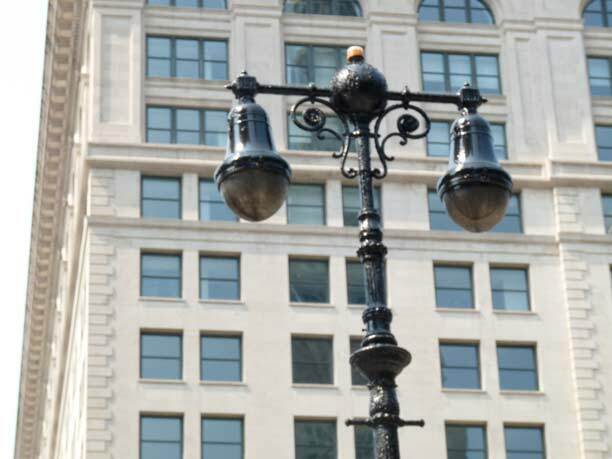 Even in the 30s and 40s, some of these distinctive poles were replaced by more conventional castiron twinlampers shown below. Note the little mailbox attached to the signpost. They had a slot at the top to admit letters, but packages had to be brought to the post offices. They’ve all but been replaced by the present day curved top blue mailboxes, but a few do remain, if you know where to look. 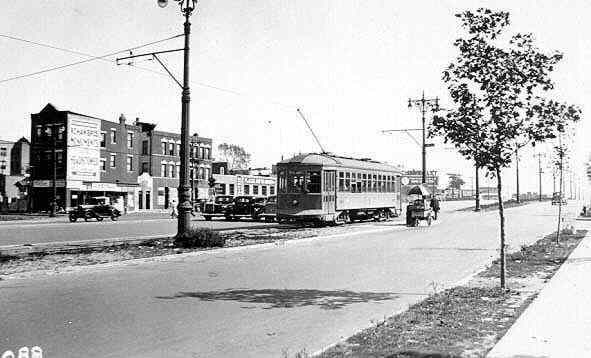 On Queens Boulevard in the 1930s, its set of twinlamps supported overhead wires for trolleys. 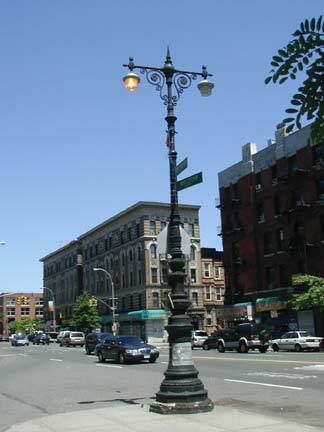 Queens Boulevard’s set of twinlamps were in place until 1969! This Twin, at Duane Street Park at Staple Street, is one of a number of retro-Twins that have appeared around town since the 1990s. Thanks to Robert Mulero for help with this page.